Since Spring is just a few days away, for my March fix I wanted to get a head start on Spring! My requests included a tan/beige trench coat, flowy dresses, and a flowy skirt with a top to match. For the most part most of my fix hit the nail on the head, but one item in particular left me disappointed. 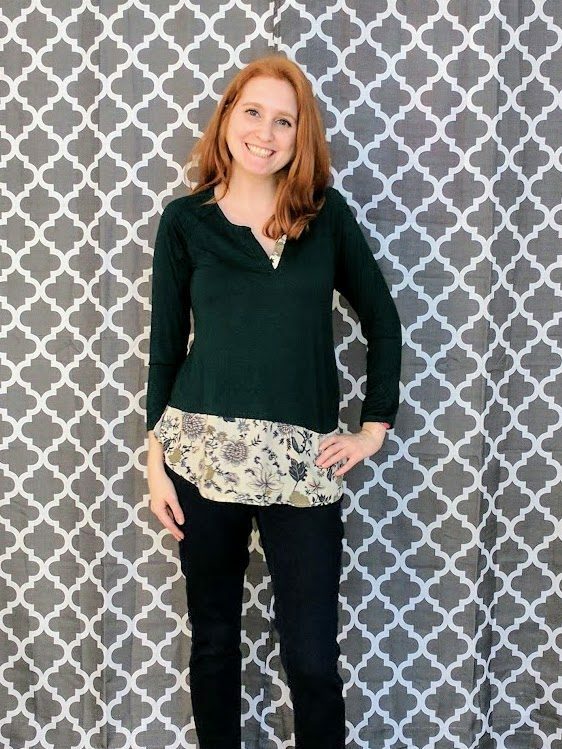 This top is another cute one from Papermoon, giving you the illusion of two tops in one, which is a style I like because it looks like you’ve put more thought into what you’re wearing than you actually did! One small thing I’d change is to make the green part of the shirt a little bit longer, it cuts off at a slightly awkward length. The colors and pattern scream Spring. I really loved how soft this top was and how the back of the top went down further than the front, making it so you could get away with wearing this top with leggings if you wanted. Another cute detail is the print in the neckline opening, something unique and unexpected! 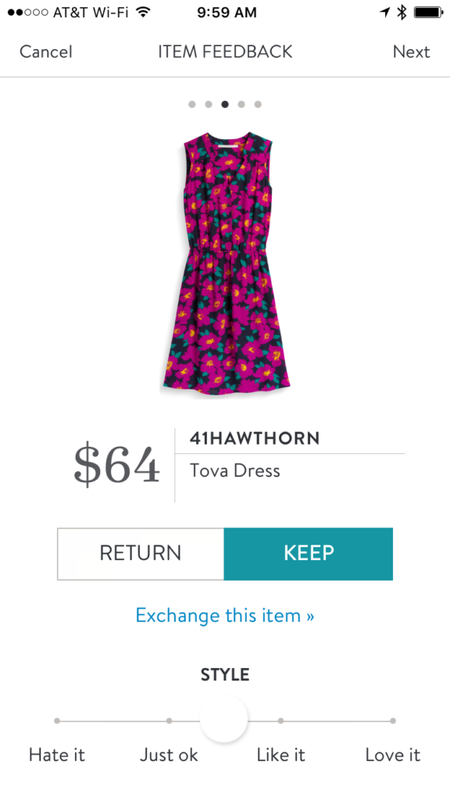 I was really hoping for a lightweight flowy floral dress for Spring and this 41Hawthorn dress ticks off all my boxes! The print is gorgeous and makes me happy just looking at it. The built in elastic waistline gives the dress a bit more shape and helps make this is a great piece for any body shape. I absolutely love how comfortable and lightweight the dress is, making it a great pick for all sorts of events and locations, be it the office or out on the weekend. 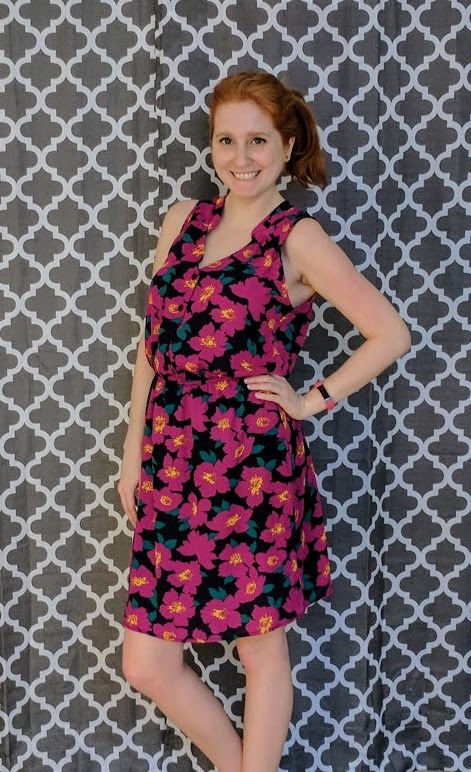 I’d also recommend this if you’re attending a bridal shower because it’s such a cheery and bright print. I’m going to showcase the next two pieces together in my personal photo, since my stylist recommend pairing them together, but let’s first start with the skirt by Renee C. I was hoping for a skirt that wasn’t too tight and form fitting that had a little bit of flare to it, and this skirt delivered. The fabric is fairly thick and structured, but you still get a great swing look to it. The pattern is a beautiful navy background with white flowers. One of my favorite colors to wear is navy so this skirt is a perfect addition to my wardrobe. When I first pulled this top out I was a little worried with how bright it was, and if it would look ok on me since I have pretty fair skin and red hair – pink isn’t always a redhead’s friend – but it certainly screamed Spring fashion. Eventually, the shirt won me over and I found it was really breezy and comfortable to wear. I can see myself wearing it in most seasons because it has some length to the sleeves but it’s also really light so it can be a pretty versitile piece. 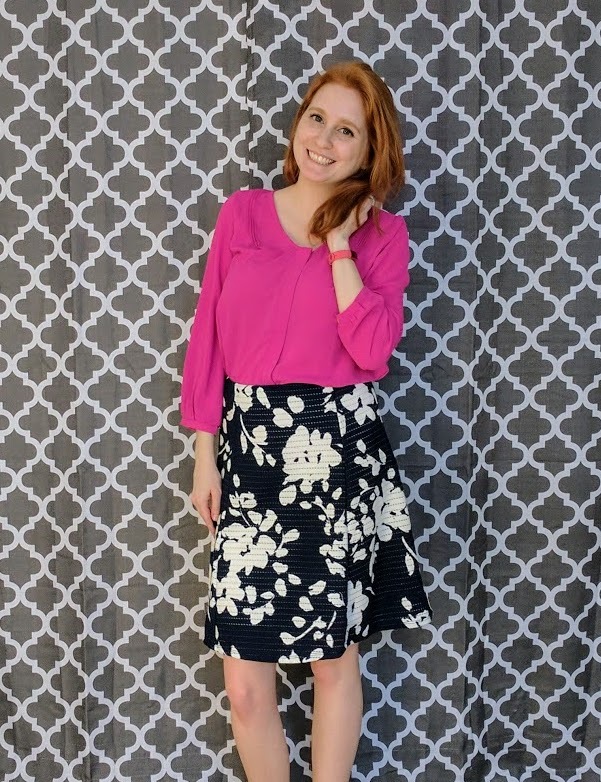 Now when I requested a skirt in my Fix, I was specific to ask for a top to go with it since I always have trouble finding tops in my wardrobe to match with skirts (I don’t trust myself basically) but when I saw my stylist suggested this hot pink top with the navy floral skirt I wasn’t sure I’d like the look. I learned my lesson though, and you can’t judge two pieces without trying them on together. I was pleasantly surprised and felt the look was fresh, young, and maybe a bit fashion forward (for my wardrobe anyways). What do you think? 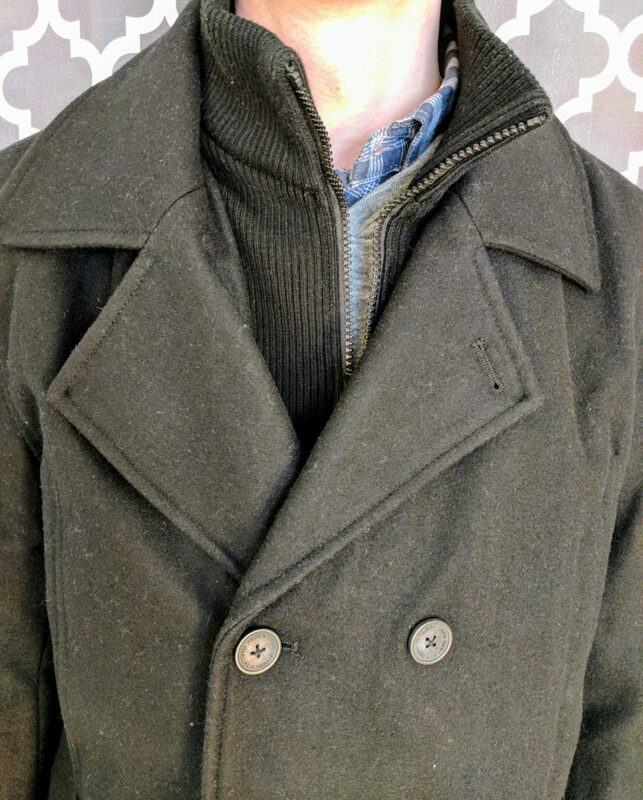 The item I was hoping to get the most was a classic trench coat, and was disheartened when I open my stylist’s note to see she wasn’t able to find one, but hoped this coat would do the trick. Do the trick it did not. First off, the color wasn’t doing it for me. It’s bright white, which is far from the tan/beige I was hoping for and I feared it would easily get dirty. The next thing that hit me was the scent. Yes, you read that right, the scent. The jacket smelled like a shower curtain liner, not something I want to go for 🙂 But I figured hey, you’ve got to try it on maybe these initial reactions will go away. Sadly, they didn’t. The coat felt a size too big for me, and it didn’t have a tie belt which really confused me. Why wouldn’t you put a belt on this coat? Without the belt the coat went out pretty far and and it made me feel like I could hide a pregnant belly. I didn’t like the look, smell, or feel of the jacket so I returned it. Thankfully it was expensive enough that it didn’t cause any issues with the savings I would have made by keeping all 5 items. Final Thoughts: Overall, I was pretty satisfied with my Fix. Several of the pieces I had seen on Pinterest and had even pinned so it was exciting to see them in this month’s box and to know my stylist continues to check out my pins. 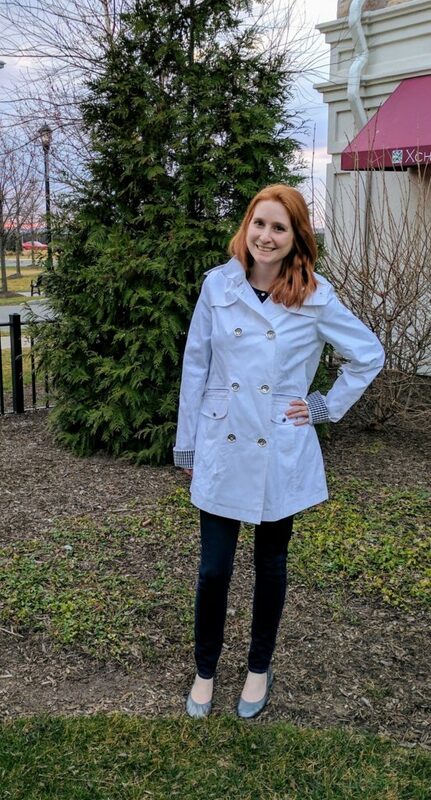 While I wasn’t a huge fan of the jacket, basically everything I had requested was provided, which is always an awesome treat and surprise because I know not every request is possible with the stock Stitch Fix has on hand. I’ll definitely be ordering another box soon to get some more transition pieces for Spring and Summer. What’s on your spring/summer wish list? Hi there! It’s been a little while since I’ve posted so I wanted to provide just a quick post that I hope helps you a bit with the everyday bustle of life. Exercise can be a great way to relieve stress even if it seems intimidating or just something else to add to your long list of things to get done in a day. I’m recommending a particular exercise that will be easy for you to fit into your schedule because you don’t need to leave your home, and you don’t need any equipment – Pop Pilates. You can find it on Youtube, participate in the comfort of your own home, and it’s free! For those looking to take on more of a challenge, I’m currently participating in Piit28 brought you by the same instructor as Pop Pilates. This program does cost money, but once again all you need is your own body, no equipment, and less than an hour of time a day (6 days a week). I’m feeling more energized now and less in a funk because I have something else to focus on. P.S. I’m doing a big review of Piit28 when I complete it at the end of this month, so stay tuned! A couple years ago I took a course at work that was about searching yourself, finding out what made you tick, and learning how to relax, breathe, and yes meditate. From that class I was introduced to a great app called Headspace. 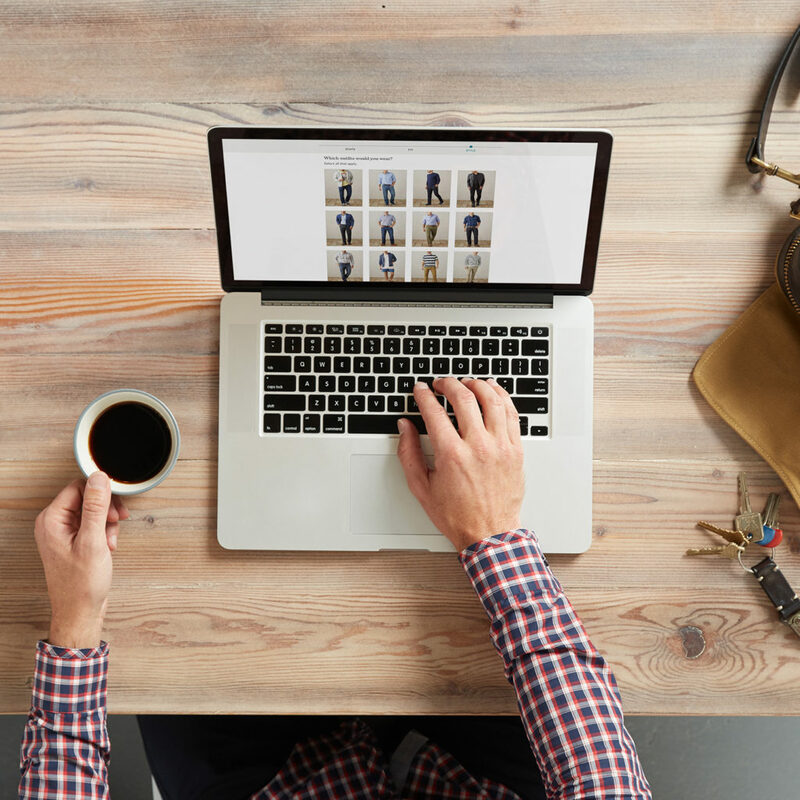 It’s a subscription service (monthly, yearly), but you can try it out for 10 days free first. I’ve found that going through a guided meditation, even if it seems all hippy dippy, is so relaxing, and really helps my brain relax and learn to let go emotions and stressors in times of need. 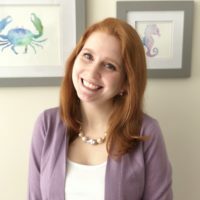 If you read this blog you know I love to read – check out my reading challenge posts! If you need to escape reality, cuddle up with a book and before you know it you’re mind will be off dreaming of some fantasy world. Last year at the age of 26 I decided to sign myself up for a library card, something I hadn’t had in probably over a decade, and it’s been great! I subscribe to FabFitFun and in my last box I received a Moleskine Weekly Notebook. I can control my schedule, capture events and projects all in one handy spot and the ability to cross of days is quite empowering. I bought start stickers at the Dollar Tree that I can use to spice things up and track things like days I did Piit28 or meditated. Hope you find a little time in your day to stop, breathe, and take your mind off of all that you’ve got going on to enjoy some peace and relaxation. Warning: This post contains a photo of blood. I’ve grown up being a picky eater, I mean really picky, I eat like a child. Besides being picky with my food selection, I’ve also had a fairly sensitive stomach for as long as I can remember. Certain foods would always leave me feeling a little under the weather. 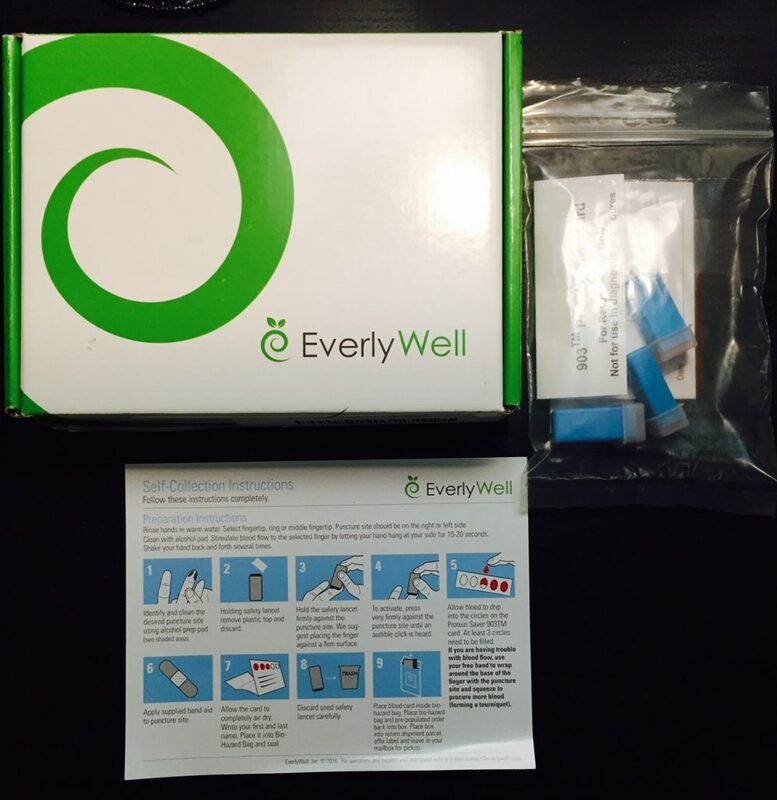 For my birthday my boyfriend surprised me with a Food Sensitivity Test from EverlyWell. I didn’t know such a thing even existed, but I was excited at the prospect of finally getting some clarity on why I can’t eat certain foods without stomach aches. My excitement quickly waned when I found out exactly how I would be getting those results – via a blood test. Does pricking your finger hurt? I’m pretty sensitive to pain and afraid of needles so I might be a little more chicken than you, but it did hurt a bit, like a tight pinch or a bee sting. I found my finger was stinging for a couple hours afterwards, a bit sensitive to touch. It took me a good 30 minutes to be brave enough to finally poke my finger. Once I got enough courage, I was disappointed to see only one blood drop come out. I had to poke myself for a second time. Of course that would happen to me. The second time around I used my ring finger, verses my middle. I recommend using your ring finger, because the blood just kept on flowing! 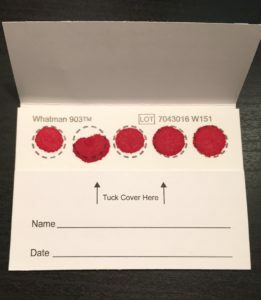 The card you’re given to place your blood sample on requires 3 out of the 5 circles to be as completely filled as possible. You must let the blood drop into the circle, you can’t smear your finger around. 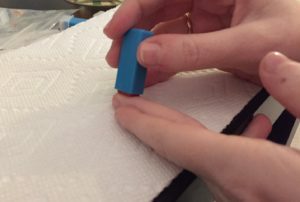 I was able to fill three dots pretty successfully after a second prick of the finger. 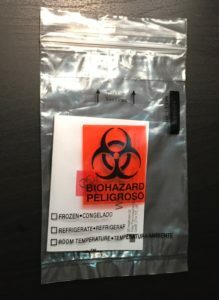 Once you’ve survived the sample extraction, it’s time to mail it back! 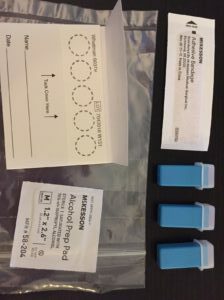 You’ll receive a prepaid package to mail your sample back in. After a quick 5 days my results were in. EverlyWell will email you when your results are complete and then all you have to do is login to their site where you can see a breakdown by food group or reactivity. Your results are displayed by showing you what level of reactivity you may experience when consuming certain foods. The ranges are Low Reactivity (you can eat these things), Mild Reactivity (you probably won’t notice any sensitivities), Moderate Reactivity (it might be good to limit), to High Reactivity (you should cut some foods out and see how you feel). Going into my results I was expecting to see certain sensitivities pop up, mainly dairy. Whenever I eat dairy, particularly cheese, my stomachs feels a little rumbly. But what I saw on the screen truly shocked me. Apparently, dairy isn’t my issue and I only have a low reactivity to those products. Now I was really confused. What’s been making me feel sickly all these years? Well, it turns out my highest level of reactivity was given to a food group I never would have suspected, grains! I couldn’t believe it! Most of my favorite foods are part of this food group. Pizza and pasta are what I live on and apparently they’ve been making my belly not feel its best. Some other surprise results, just to name a few, were that I’m moderately sensitive to white potatoes (my favorite vegetable on earth), carrots, black pepper, cinnamon, and chicken (WHAT, I love chicken nuggets). Seeing these results was extremely eye opening. Will I change my diet? No, not completely, but I might try some gluten free items in the future to see if I notice a difference in how I feel. Overall, I’m really glad I was brave enough to take the test because now I can truly understand what foods might make me feel not so great. I highly recommend giving EverlyWell a try, especially if you’re like me and you’ve experienced tummy pains and upset stomach for years. You mighe be caught of guard just like me. Want to give EverlyWell a try? Use my discount code for 10% off! 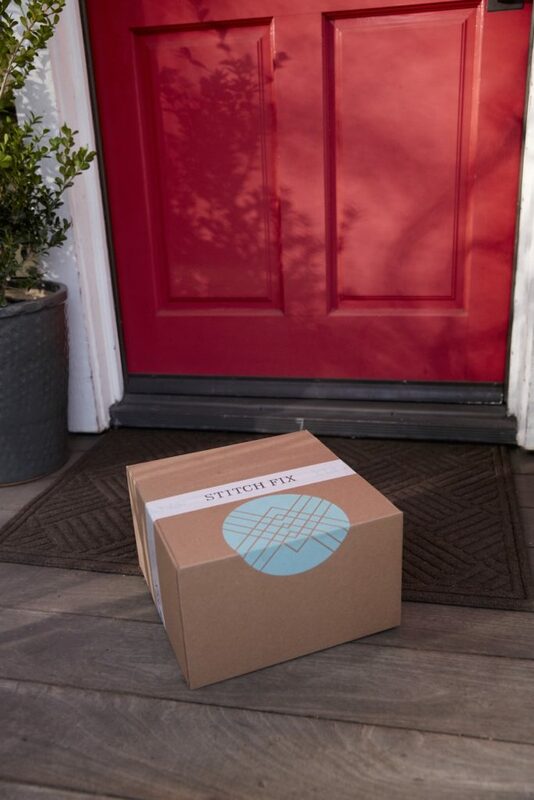 Stitch Fix used to be all for the ladies, but a few months ago they launched a service for men! 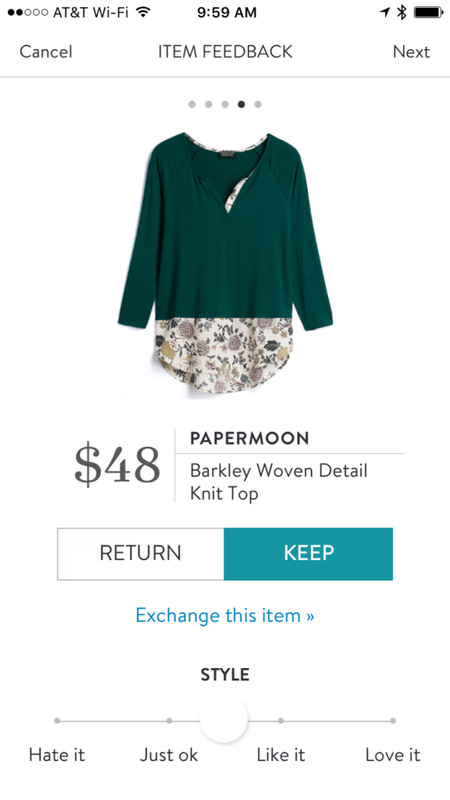 When I heard they were now including guys, I really wanted to get my boyfriend or dad involved in the amazingness that is Stitch Fix. 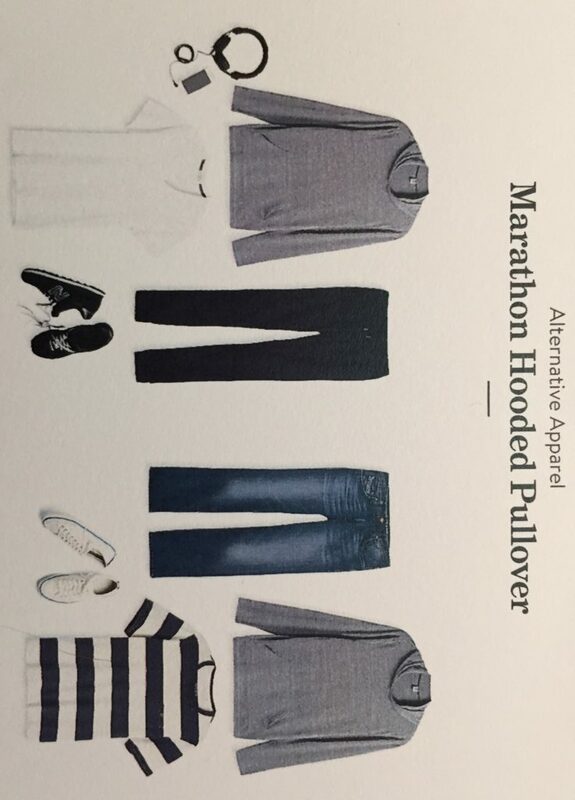 Lo and behold for Christmas my boyfriend received a Stitch Fix gift card from his brother (smart guy!). For my boyfriend’s first fix, Brian received two collared shirts, a hoodie, a pair of pants, and a peacoat. Let’s take a closer peek! 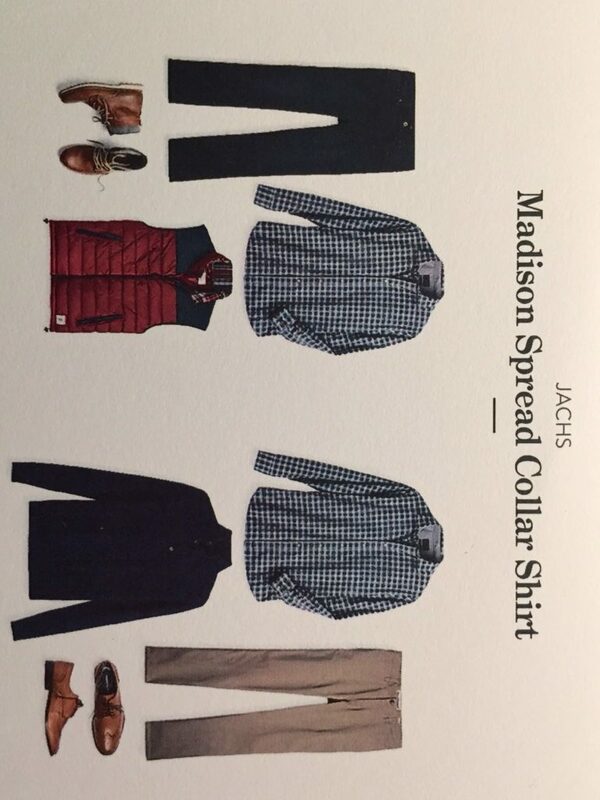 The Jachs collared shirt was a great color and the plaid design was really nice. I could tell style wise it was something Brian would approve of, but style and fit are two different things! While the overall cut and fit were decent, the sleeves caused some frustration. “The sleeves were too short” says Brian. 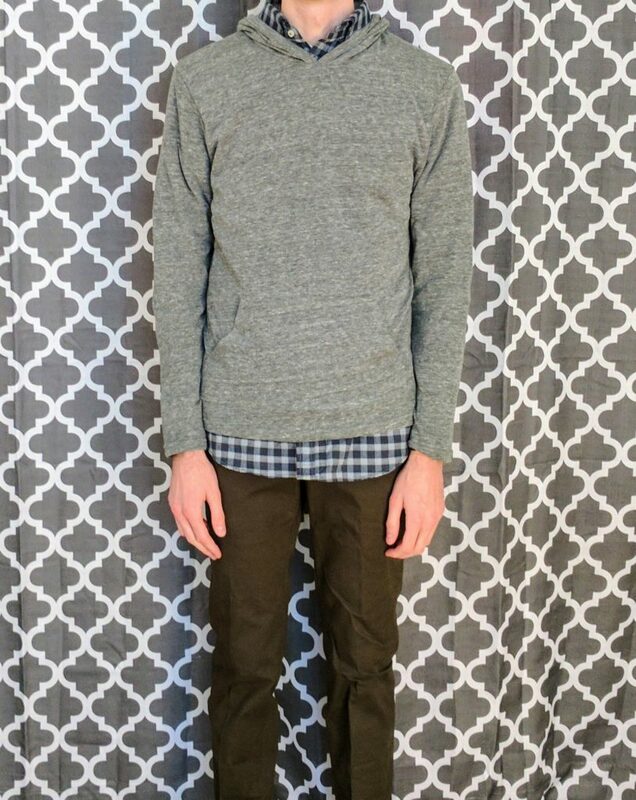 For tall guys sleeve length is important. 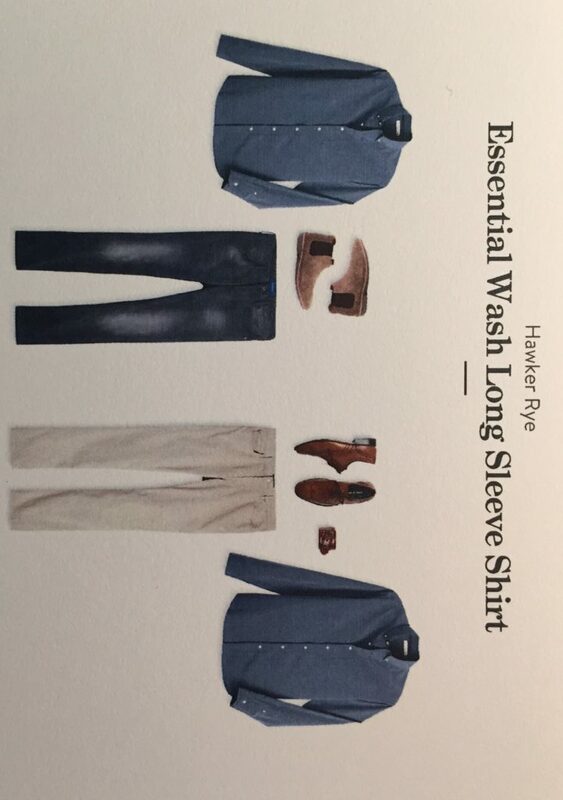 I’d say if you’re just around 6ft or slightly shorter this top would be great, but if you’re over 6ft tall I’d pass on this shirt if you worry about your sleeves rising up a bit on the wrist. Brian opted to return the shirt because of the slight shortness in sleeve length. Hoodies are popular amongst women and men, but not my boyfriend. For whatever reason he’s never been a fan of hoodies so I was curious to see what he thought of the hooded pullover he received from his stylist. According to Brian, “It was only a decorative hoodie.” While the hoodie was cute, and I felt the coloring went well with the above plaid top he received, it really didn’t add any warmth and seemed more like an accessory piece than something to keep you warm. He ultimately decided to return the hoodie just because he’s not a hoodie guy, but I probably would have kept it if I was him because it looked really great and added a bit of oomph to the outfit we put together from his Fix. Solid button up shirts should be a staple in any man’s wardrobe. They make a look come together effortlessly and can be dressed up or down. 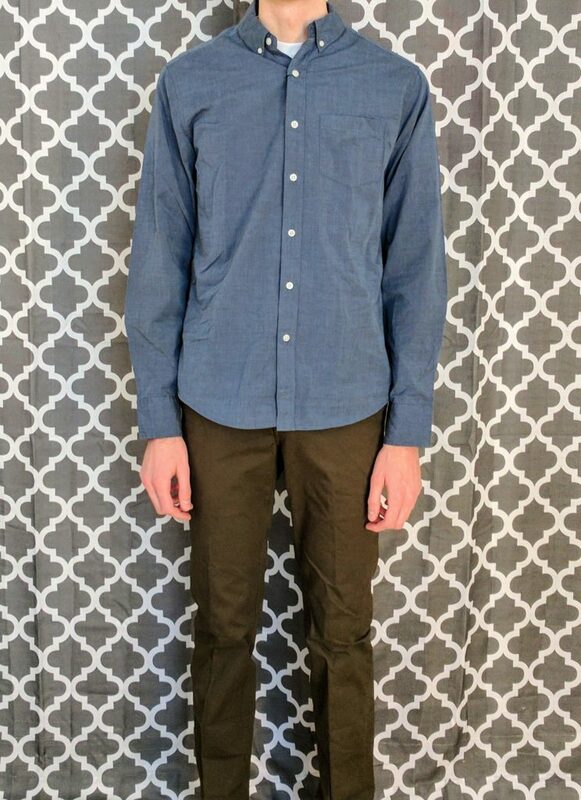 This Hawker Rye shirt comes in a really great blue hue that will surely make blue eyes pop 🙂 Comparing this top with the first long sleeved top in his Fix, Brian felt “The sleeves were a little longer and the top fit nicely.” The cut of the shirt was nicely done, not appearing baggy or oversized like some button ups can. If you’re a guy on the slimmer side, like Brian, this shirt will fit great and add a nice bit of color to your wardrobe. You’ll be able to pair it with an assortment of pants colors from brown to black and even jeans. 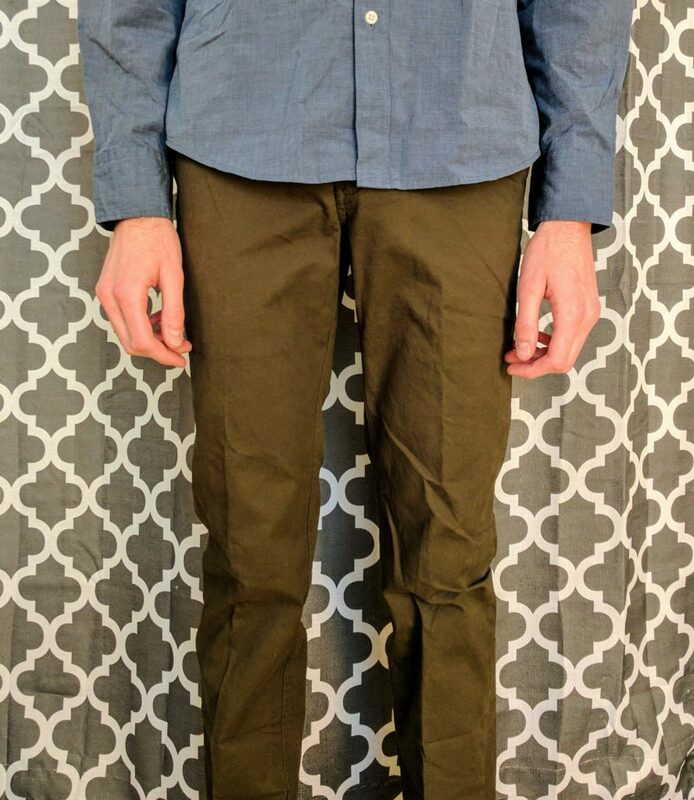 Finding a pair of great fitting pants can be a challenge for taller guys, and I wasn’t sure Stitch Fix was going to be up for the challenge but they succeeded with this trouser from Ben Sherman. 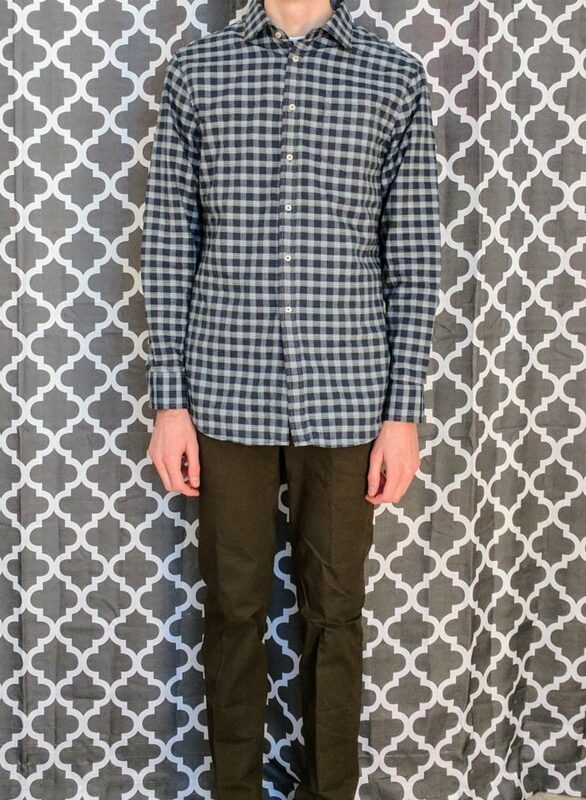 “They are very long, which is nice.” For tall guys (6ft +) finding pants that fit in the waist and then have enough length to not be high waters are hard to come by and highly coveted. 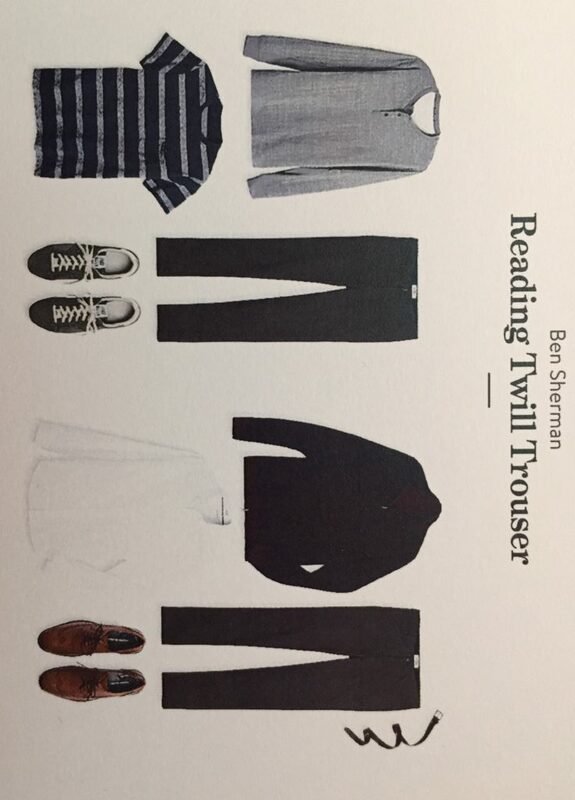 I think we’ll be checking out Ben Sherman more in the future to see what other great pants they have to offer. One of our favorite things about this pair is how they’re well fitted around the legs, providing a skinny pant look without being tight. Coats can be a hit or a miss. You never want to look like a marshmallow or like your coat is wearing you. While I’m a fan of black peacoats on men, they need to be really well fitted. Unfortunately for Brian, this coat didn’t fit super well. “It was a little baggy, and it’s strange having a zipper inside of it.” Zipper you say? 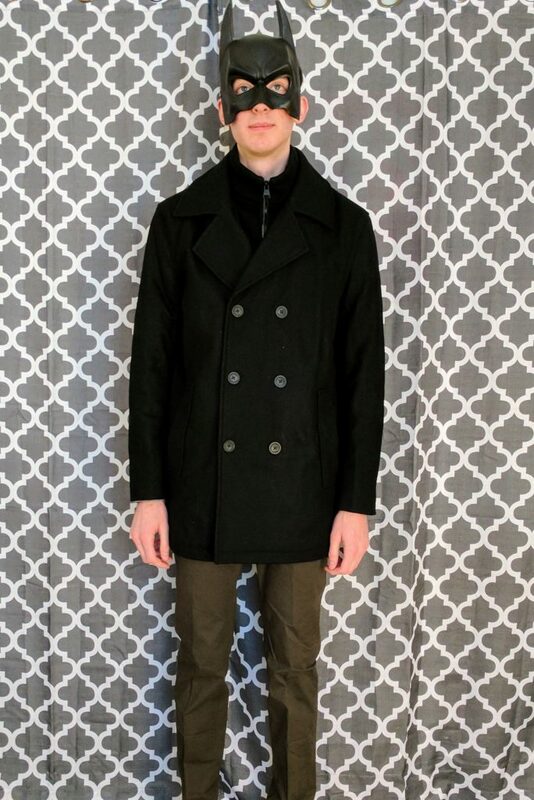 Yea, this peacoat actually had a zipper at the top where peacoats tend to have an opening, which was a bit unexpected. The zippered section will definitely add warmth so if you’re looking for a warm coat, give this one a try. The zipper made Brian feel like he was wearing two different coats and didn’t give off a traditional peacoat feel. 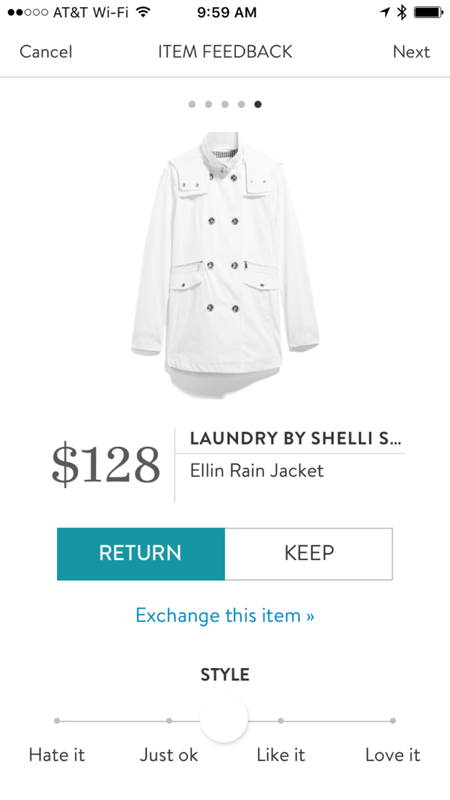 It was back to Stitch Fix with this coat. Brian, or shall we say batman, wanted to bring a little mystery to the photo shoot. Final Thoughts from Brian: It was great getting some clothes without having to do any work myself, which was nice for a change. Yet, I’m not sure how personalized the experience was, but looking forward to ordering another fix. Final Thoughts from Katie: Overall I was pretty impressed with the Fix Brian received. 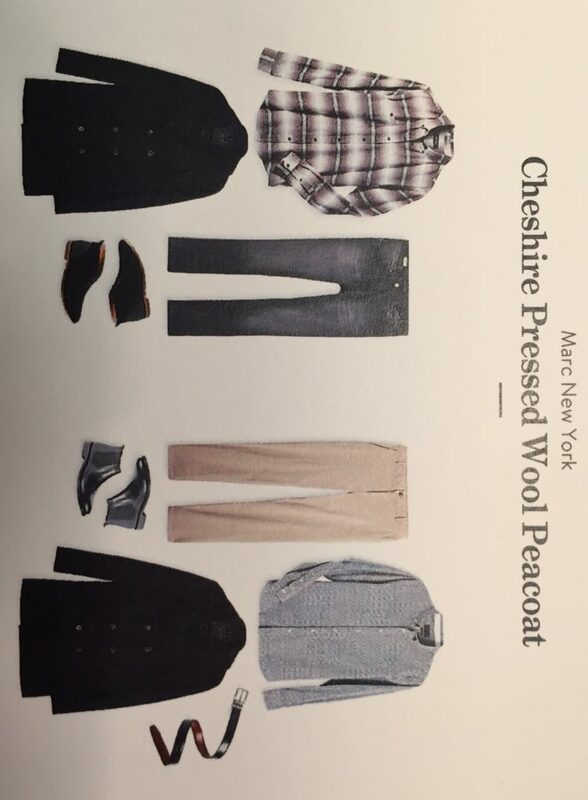 I liked all the pieces minus the coat and was happy to see none of the items were too fashion forward for Brian’s first box. 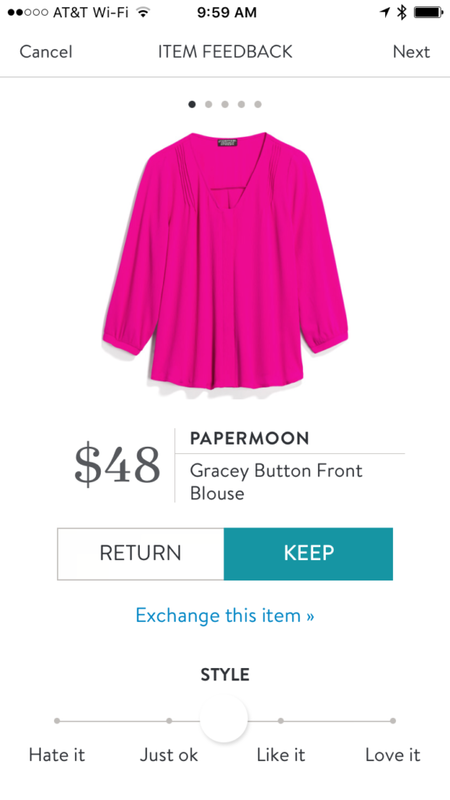 I hope that Stitch Fix continues to carry long length items (tops and pants) so that we can see what else Stitch Fix has in their inventory. Don’t forget Valentines is under a month away! 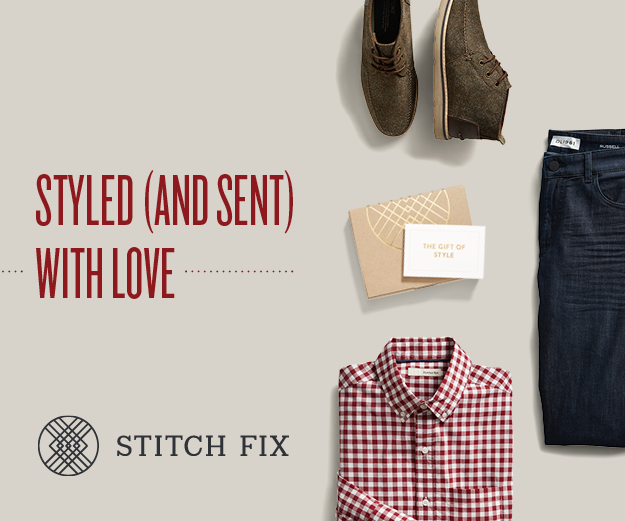 A Stitch Fix gift card would be a great treat for your loved one. 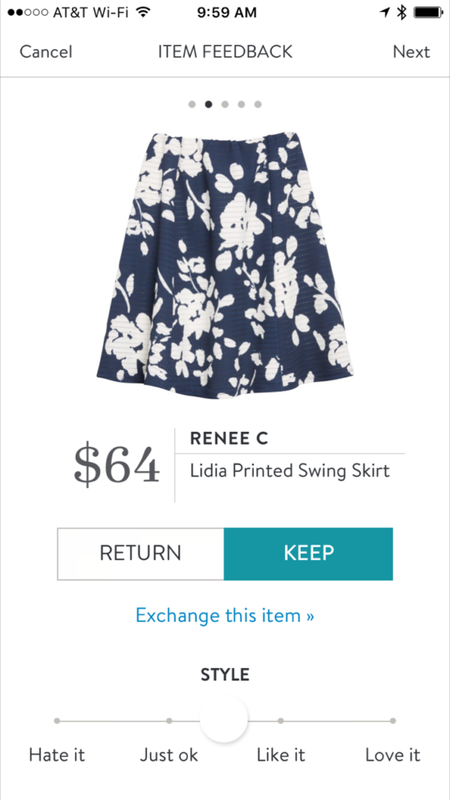 Sign up for Stitch Fix today and see what pieces you might fall in love with.